Malin Klingsell, Swedish hiker and vegan, blogging at www.friluftsvegan.se, took 6 months off from work and went to the US to hike the Pacific Crest Trail. I talked to her about her hike and the lightweight gear she used. 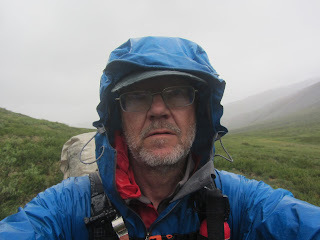 Jörgen: Could you briefly tell us about the PCT and what made you want hike it? How far and for how long did you hike? 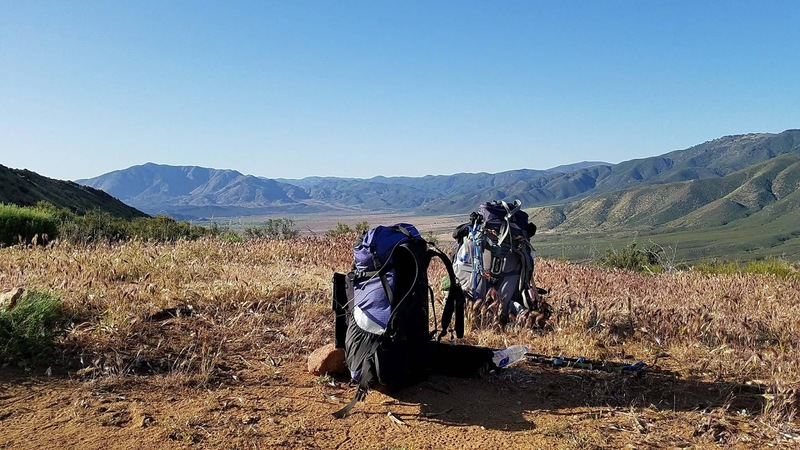 Malin: The Pacific Crest Trail is a 2650 miles long trail, in the US from Campo at the Mexican border to Canada. It is a challenging trail that goes up and down mountains, first in the desert, then through the high snowy Sierra and lastly through green forests and over mountains in Oregon and Washington. I read an article in a magazine about Linda Åkerberg who hiked the whole trail in 2016. I had already wanted to do a long hike and now it was the right time in my life to do it. Two days after reading the article, I had got 6 months off from work and started planning my adventure. It just felt so right! My plan was to do a thru-hike, which means to hike the whole trail in the same year. But it turned out to be a tougher year than usual with lots of snow and that slowed me down. After having to skip parts of the Sierra because of safety I lost some motivation and then it was a combination of reasons that made me decide to quit early. I hiked for 4 months and 1328 miles (2137km) in total. I am proud of every single mile. It was an amazing experience. Very tough, but also very rewarding. 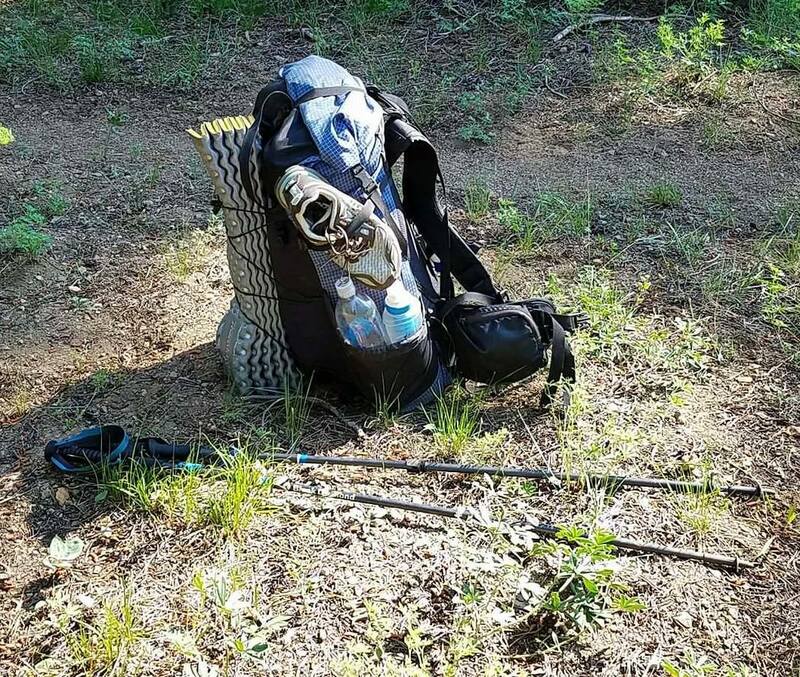 Jörgen: What kind of backpack did you use, what made you choose it and how did it work on the trail? Pros and cons? Malin: I hiked all 1328 miles with an ULA Circuit. I chose it after reading about the most common backpacks used on the PCT. It turned out to be a good choice. I never regretted it. Pros and cons: A relatively light backpack that weighs 41 ounces (1.16kg) and holds 68L. It has a roll top so it can be adjusted in size to its contents. It was very comfortable up to a certain weight. I seldom weighed my backpack, but I noticed that when it was fully loaded with food and water it hurt my shoulders. It didn't sit well enough on my hips then. But at lower weights I had no problem at all. It has nice big sidepockets and a huge front mesh pocket. I could miss having a top pocket at times, but I got used to organizing my pack and started liking it more and more. It is a light pack so it has few extras. But it still has everything you need for a long distance hike. Most of the friends I met had the same pack like me or changed to it eventually. Jörgen: What kind of shelter/tent did you use, what made you choose it and how did it work on the trail? Pros and cons? 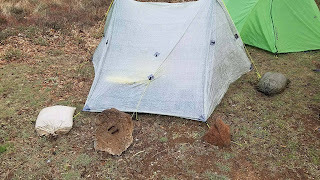 Malin: I started my hike with a Zpacks Duplex tent. A true UL tent made of Dyneema Composite Fabric that weighs 595 grams. Pros: Very light and it has a lot of space for one person as it is a 2 person tent. Cons: This tent actually drove me insane haha. The Duplex is not freestanding, and the strong winds and hard ground in the desert made it very difficult to set up and get it to keep standing. My first "trail name" was Rocks, because I had to secure all the stakes with lots and lots of rocks. But even with all the rocks it fell down in my face multiple times. One night the desert winds were extra strong, they were howling in the valley. 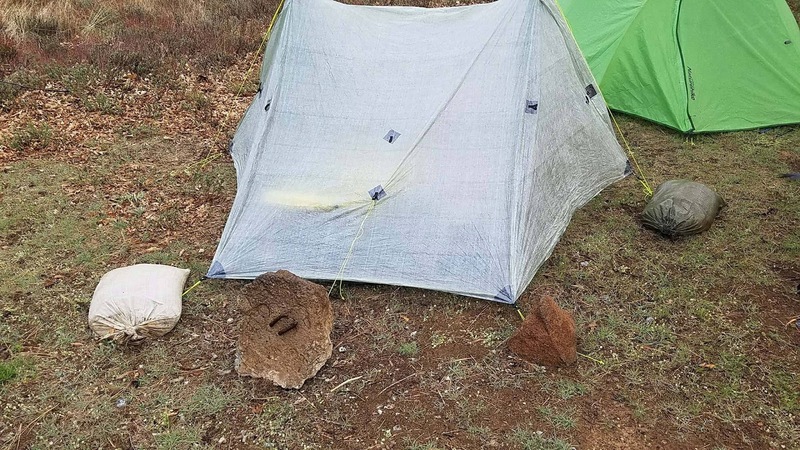 The tent collapsed on me four times that night. My headlamp was out of order, so trying to set it up in the dark was hard. After a while I gave up and curled into a ball in the middle of the tent. I woke up covered in sand. I had sand between my teeth. When I went out of the tent I saw a small tent next to the fireplace. It looked like it hadn't moved during the night and out came a smiling and rested hiker. I decided there and then, that was the tent I wanted. So after about 1 month of struggling with the Zpacks tent, I bought a Big Agnes Copper Spur HV UL 1. Pros: Freestanding, double layers (one with mesh and one rain cover), lots of nice pockets, plenty of space for being a one person tent. Easy to set up, easy to take down. I loved it! Setting it up made me happy every time, when I compared it to my first tent. It keeps the heat better, it performed well in rain, it dries fast. I can fit myself and all my gear in it if I need to. It is even possible to sleep two persons (without gear) if you like to cuddle. Cons: Heavier than the Zpacks (but oh so worth it!). Weighs 1.13kg. I also bought a extra ground sheet from Big Agnes. 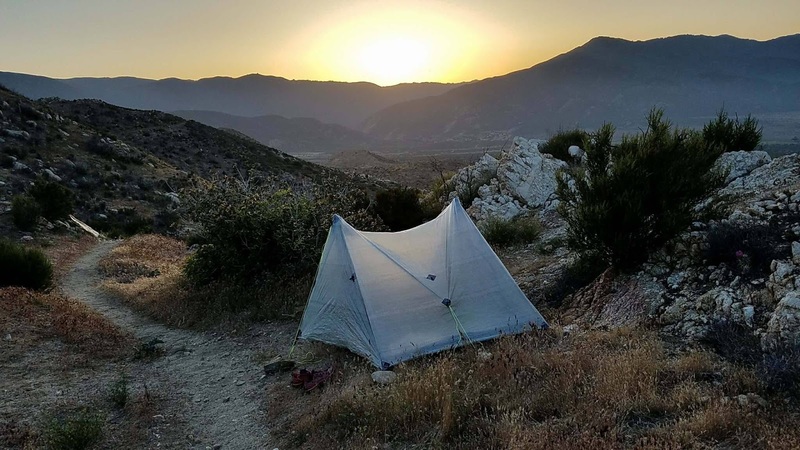 Jörgen: What kind of sleeping gear did you use, what made you choose it and how did it work on the trail? Pros and cons? Malin: This question is tough for me to answer, because I really wanted to do the whole hike without buying any animal products. However, because of my own safety I had to buy an ethical down bag about a month into the hike. This is why. I started out with an As Tucas Sestrals Blanket, apex 200, size M. Weighing 670g. Plus insulated pants and a balaclava, also from As Tucas, to keep me warm. All of the items were insulated with synthetic material, which is why I chose it. Pros: Very light. It can be buttoned up into a partially open bag or completely opened up into a blanket. The insulated pants are amazing and I kept them the whole hike. I called them my fluffy pants and used them very often. It felt like being inside a sleeping bag. Very cozy and warm. Cons: Unfortunately this sleep system did not keep me anywhere near warm. Even in the desert I was ice cold during the night. Every movement would let cold air sip into the bag and it did not cover my shoulders properly. The balaclava had a too small hole for my face and was quite uncomfortable. I decided I needed something much warmer, especially for the mountains in High Sierra, to keep me safe. I first bought a synthetic sleeping bag, but when it arrived it was gigantic, very heavy, and still didn't keep me warm. So I googled ethical down, went to the store in Idyllwild and bought a Western Mountaineering Versalite 10F (-12C) bag. It weighs 850 grams. Pros: Really warm, pretty light, compresses into a small volume. The feathers are collected from the ground, from birds that are walking freely. Cons: Down. I don't want to support the animal industry and even though it is ethical down I can never know for sure that the animals are treated right. I really hope that the synthetic feathers will become better in the future. For me who is a cold sleeper, a girl (girls typically sleep colder than boys) and vegan, it is really hard to find good options. With that said, if anyone knows about a great vegan bag, please let me know. When I started the PCT I was a side sleeper (towards the end I could sleep in any position), so I wanted to find the most comfortable mattress for my hip. After reading about different options I chose Thermarest NeoAir XLite. The first one I bought was the womens version, a bit shorter and warmer than the regular version. It turned out to be a bit too short though and after cowboy camping under the stars a few weeks into the trail, it got a few holes in it. So instead I ordered the regular version (350 grams) and it was much better in length. I was very happy with my mattress, it was really comfortable and I slept suprisingly well. The only downside was that it can be a bit noisy at times, but mostly it didn't bother me. Many people had the foam pad Thermarest ZLite Sol. Some had just that foam pad and others had an inflatable pad on top. I was always jealous of that pad because of how nice it was during breaks. It is very durable, but in my meaning also very uncomfortable to sleep on. After a week in the Sierra I needed more insulation against the cold from the snow, so I bought the small version of the ZLite Sol (340 grams, on a side note, many hikers actually started with the regular size, but then cut off a lot of the pad to save grams). From the second I bought it, I loved it. 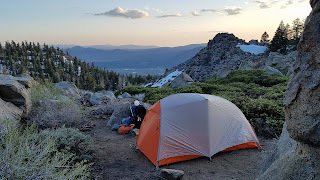 For the Sierra it gave me lots of insulation with double pads and for all the naps during the breaks it was heaven. It also protected my inflatable pad. I have heard you can get used to sleeping on only this pad and it is all about your own comfort level and what you prioritize to carry in your pack. 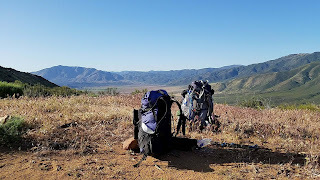 After the Sierra I just couldn't let go of the Zlite Sol and continued carrying double mattresses. From an ultra light perspective, this might be madness. But after spending months in the wilderness, it became very clear what was important to me, and therefor worth carrying. 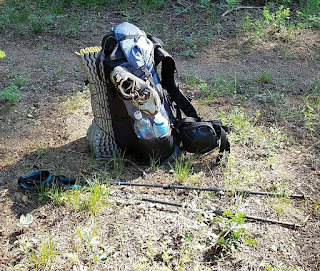 I also had an inflatable pillow, that I at one point gave up during a shake down (this is when somebody goes through your pack and tells you what to leave behind). But after a week I really missed it and took it back. Worth its weight in gold to me. Made all the difference in comfort level. I tried clothes in a stuff sack as a pillow and of course it works, but it just isn't very comfortable. But again this is about preference. Jörgen: What kind of footwear did you use, what made you choose it, and how did it work on the trail? Pros and cons? 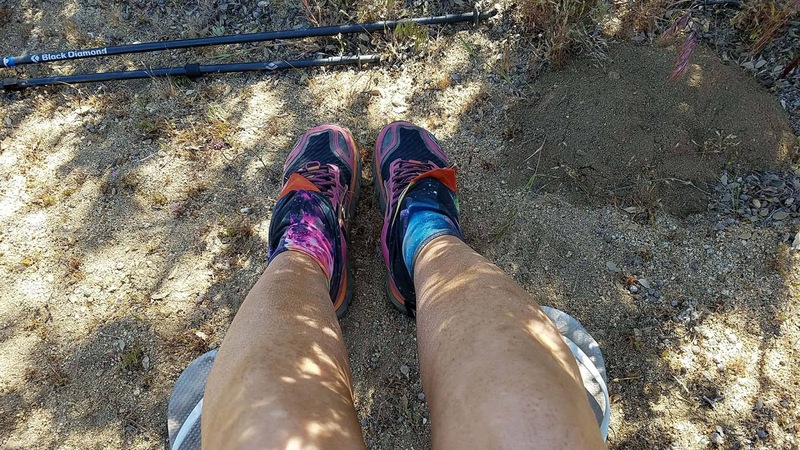 Malin: I chose Altra Lone Peak 3.0, trail runners, for the desert. I chose them because they are very popular on the pct and they are also vegan. Pros: Light and comfortable. Dries fast. Lots of space for the toes. Cons: They killed my heals. I had constant blisters on my heals wearing these shoes. For the high Sierra I chose Altra Lone Peak 3.0 Neoshell Mid. Pros: Very comfortable, no blisters and no problems with my heals. Cons: They get very wet in the snow. After the high Sierra I continued hiking with the Neoshell shoes as they were much better for my feet. Yes the question about membranes like Gore tex and copies like Neoshell in shoes is an interesting one, I think. For me it never really kept my feet dry, just slowed down the drying process. My new shoes are actually the new model from Altra with mesh instead. Altra Lone Peak Mid Mesh 3.5. My feet will get wet anyways but now they will have a chance to get dry. 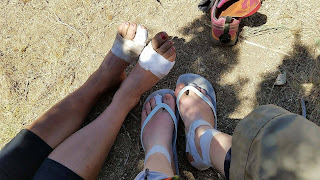 It is a general thinking on the PCT, that boots is a no go, at least for the sections without snow. Everybody thinks about being as ultra light as possible and that anything you put on your feet weighs a few times more what you put on the rest of your body. For me it was a new way of thinking, but I really liked it. The desert is a really hot place and wearing boots there really doesn't make sense. For the High Sierra, however, the opinions on which shoes to wear were not as unified. Some continued to wear trail runners with normal gaiters, others bought a mix between trail runner and boot (like I did with the Mids) and others bought big boots. Most people bought snow gaiters. Different choices have different pros and cons. Trail runners: Very light. Gets really wet in snow, but also dries very fast. Can't be worn with crampons, only with micro spikes, which means less grip in the snow. Light boot: More support for the feet, slightly more waterproof, but also dries a bit slower. Works with both micro spikes and crampons. Heavy boot: Good support for the feet, but also heavier. Better water resistance, but if they get wet it is very hard to get them dry again. My friend had heavy boots and he loved them, until they got wet. He didn't have to use crampons most of the time, because the traction underneath the shoes was good enough. In general, his feet was definetaly drier than mine. But they were not good for walking on any hard surface, as they are very stiff and hurt the feet. 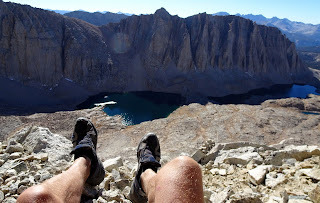 Jörgen: What is most memorable from your PCT hike? Is it something you would recommend? Do again? Malin: All the people I met. The amazing trail angels that help out along the way. The mental and physical challenge of being out in nature for months and pushing my boundaries. I recommend it to everyone who wants an adventure! I am sure I will be back on the PCT one way or another, I just don't know when. I might hike the sections I missed or try the whole trail again. The trail for sure has a special place in my heart! 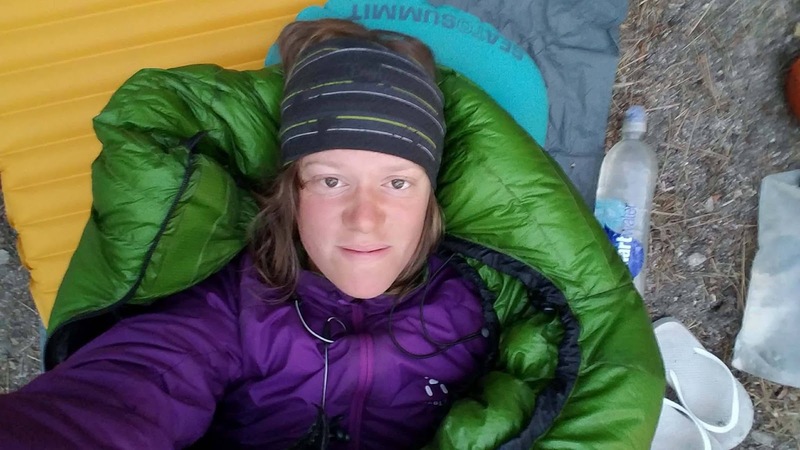 hi, i'm a vegan hiker from the uk and i can certainly sympathise with the sleeping bag issue. 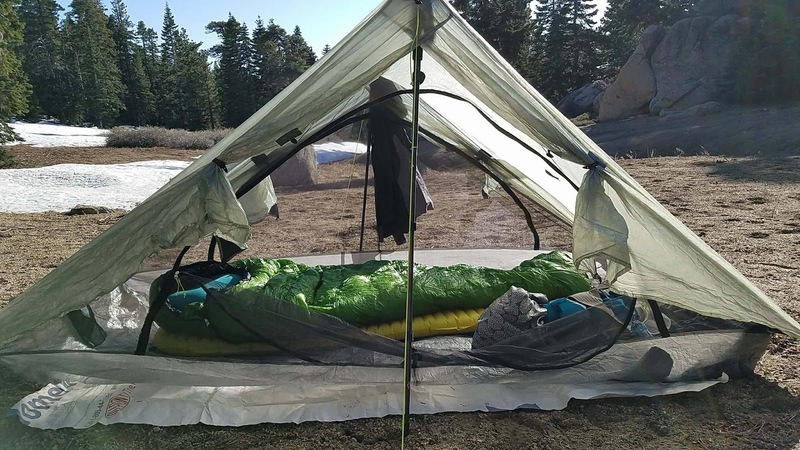 for 3 seasons i use my mld spirit quilt which takes me down to freezing, but for warmer sleeping bags with an ethical bent, i can see the case for Tundra Pure from Poland, who use high quality down harvested from the nests of living eider ducks - https://www.tundrasleepingbags.com/ the bags also come with water resistant ends which is really handy in a small tent! all the best, steve, england. Nice to read about the process about finding out priorities, realizing what works in the given situation and not being to dogmatic about weight.